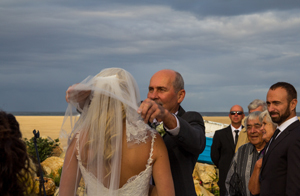 On May 17th the air around Milkwood Manor crackled and fizzed as wedding planners, florists and chefs were weaving their magic for what turned out to be the most beautiful beach wedding many had ever seen. It was to be Dale Hobbs and Nicci Du Buisson’s big day and everything had to be perfect, and where best to start than with the perfect wedding venue. 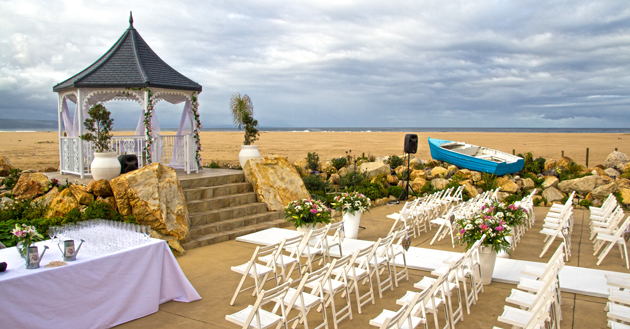 Perched on top of the world-famous Lookout Beach Milkwood Manor has the most enviable position of any wedding venue, with views over the Indian Ocean to the majestic Tsitsikamma Mountain Range. The ever changing Keurbooms Lagoon adding a shimmer and sparkle to the backdrop. With the help of the wonderful staff from Events and Tents, Plettenberg Bay’s top event hiring company, the parking area in front of the Manor was transformed into a ceremony area fit for a queen. The Victorian gazebo, bedecked in flowers and drapery, turned heads from beachcombers and strollers all morning round and many ooh’s and aah’s were heard. When the time arrived for the lovely bride to make her first appearance for the day the ever angelic ensemble of Garden Route Musique readied their instruments to play the Canon in D to set the rhythm for the slow march down the aisle. Accompanied by her doting father Nicci looked like an angel from heaven in her pristine, tight fitting wedding dress. Tears and tissues were seen throughout the sea of 107 wedding guests witnessing the glorious event. Once the formalities of the occasion were concluded the guests were further entertained by the string trio with soft, classical melodies, and an array of delicacies from the Lemon Grass Seaside Restaurant. As the cocktails and snacks flowed the guests were able to enjoy and marvel at the surrounding natural beauty that sets this venue apart from all others. The Lemon Grass Seaside Restaurant was the perfect setting for a seaside wedding reception with its walls of glass and uninterrupted views over the golden beach. A menu choice of Roast Beef, Lamb or Thai Chicken Curry enlivened the guest’s palates, and champagne set the atmosphere to jubilation. The décor was out of a fairytale with blossoms that perfumed the air and fairy lights and candles creating the lighting of pure romance. If you would like to have your wedding at Milkwood Manor on Sea and the Lemon Grass Seaside Restaurant you can fill out the contact form on our beach wedding page or phone us direct. We look forward to hearing form you. 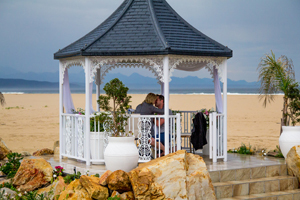 Staying true to the old adage that love begets love, Jaundre van Wyk was so inspired by the beautiful wedding when he and his beautiful partner, was strolling on the beach that Saturday that he decided to propose marriage to her the following day exactly where Dale and Nicci had said their vows. There were even some of the beautiful flowers left for them to make the occasion as romantic as could be. Congratulations to this awesome couple, and here’s to wishing you a fruitful life together. 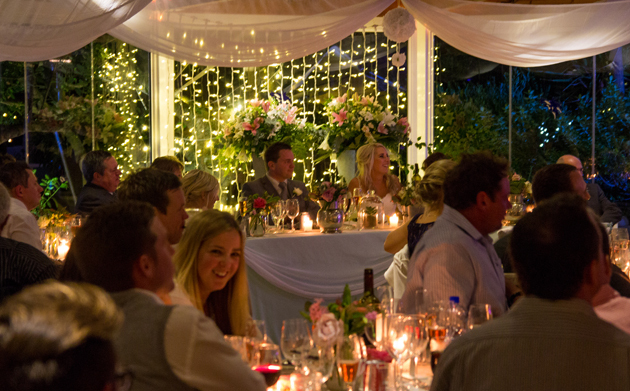 We’re holding thumbs that you choose Milkwood Manor as the venue for your beach wedding celebrations. 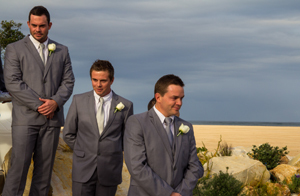 5 Responses to Beach Wedding Bliss, A Love Affair!